After having used it for a few months, I’m gradually begining to think that the reversed scroll direction in MacOS is a bad thing. Or at least, an annoying thing. Partially, this is because my cursor keys are now backwards – pushing down on my cursor key scrolls a web page in the opposite direction that dragging 2 fingers down on the trackpad does. Surely the same argument that applies to reversing the trackpad should have been applied to the cursor keys? Except that, of course, if there’s an actual cursor on the screen, pressing down-cursor should move the cursor down the page, potentially scrolling the page up. It would be absurd to have the cursor keys reverse meaning just because there’s a focussed text box on the page. But mostly I think it’s wrong because I’m having to use Windows for a few things recently and I’m hating the overhead of having to deal with both scrolling directions. Every time I try to scroll it feels like I go the wrong way. I find it hard to believe that Windows is ever going to change its default scroll direction, so thanks to Apple’s change I’m forced to choose between two failure cases – either I use the Apple default and get confused every time I use Windows, or I use old-style scrolling and get confused every time I try to use someone else’s computer, as well as being held hostage to Apple ever removing the option in a future version of the OS. I was initially in the “you’ll get used to it” camp. I did get used to it. I like using system defaults wherever possible, and adopting new conventions. I even prefer the new scrolling direction. And I don’t mind differences that I don’t have to deal with very frequently – for instance, the close window button under Windows is in a different corner and I can happily not care about that. But I scroll things all the time. It’s a really decent command-line, too – it’ll do the obvious “open file” and “open folder as project”, as well as the surprisingly useful “pipe into me to open text as a document” and the “edit file and hang command line till closed” that you need if you want to use it as a EDITOR shell variable. Nice. [CHANGED] Change next/previous file tab key equivalents to shift command [ and ]. This has become the de facto standard. If you use a European keyboard, these are now awful defaults – ⌥⌘8 and ⌥⌘9. I believe that Safari on these platforms uses ⌥^ left & right, but TextMate doesn’t. This is a pity, especially as there’s a blog entry on their site from 2007 about this exact problem. But never mind, it’s fixable, because MacOS lets you change keyboard shortcuts at a system level. Open System Preferences, and select the ‘Keyboard’ applet. Pick the “Keyboard shortcuts” tab, and the “application shortcuts” option on the left. Then click the ‘+’. 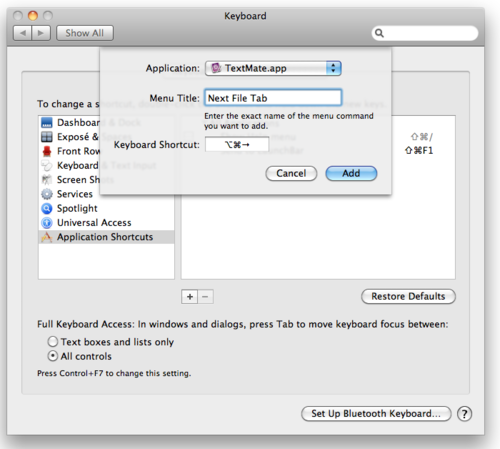 Choose TextMate from the drop-down, and type the exact name of the TextMate menu option to want to override (“Next File Tab” here). Then add the keyboard shortcut you want. Do the same for the other direction. Thus, an application in Snow Leopard cannot use a creator code attached to a document to bind that document to itself. Well, as far as I’m concerned, good. I don’t think I’ve opened a document by double-clicking on it in years – the unpredictability of ‘which of the 4 text editors I have installed is going to open this time?’ has led me to stick a TextMate icon in my Finder toolbar, and I open all text files by dragging them to that icon. Likewise, I have an Acorn icon there I drag images to. For other file types, I tend to drag them to the Dock. Why on earth would I want the preferred text/image editor of whoever originally wrote this file to affect what application I use to edit it? Now I might be able to cure myself of the habit, and go back to trusting my computer to open files in the apps that I actually use. Another week, another Shelf release – this one is 0.0.12 – read the release notes or download the binary. Loads of stuff in this one, but muttley may like the fact that you can now turn off the background poller and have Shelf look for context only when you hit a global shortcut key. This will also make life nicer for people with smaller screens who don’t want this widow popping to the foreground every time it can figure out who you’re looking at. Other than that, there are lots of improvements. Shelf should be faster and make less gratuitous network requests. Feed display is prettier, and I make an effort to display recently updated feeds at the top, rather than in random order. So, I have a new release of Shelf, having finally been inspired to put a bit of effort into the scary refactorings I was putting off. It’s internally much better than the last one, though I still have places I can take it. Feature-wise, it’s only a little better, though. Feeds look nicer. It should be fast, and caches the contents of remote feeds better, so it’ll thrash the network less. The big thing is the Google Social Graph integration. Disabled by default, because it’s a privacy nightmare, I can ask Google who the current page in our web browser belongs to, to found out a person to display in Shelf. Once I’ve got a person, I can also ask Google what other URLs they advertise about themselves, so you no longer have to stuff dozens of URLs into your Address Book cards just to see interesting things about people. Looking at Brad’s homepage is a good torture test..
I’m alwo working towards making Simon happier, with a couple of preferences determining how the window should be displayed. It’s not all the way there yet, but I’m moving..
Get the full release notes here. Amazingly, Shelf is still fun to work on. Hence version 0.0.10. Read the release notes. These version numbers are just jumping around randomly now. Well, ok, they’re not, but not every version escapes to the world. Anyway, download the new Shelf – this one has an icon! And it now includes Sparkle, so it’ll update itself automatically from now on – you can stop visiting my blog every 10 minutes to see if I’ve released a new version now. Incidentally, Sparkle is <i>stupidly</i> easy to install – everyone should use it. It’s awesome. I’m going to start keeping a proper ChangeLog now, because I have no idea what’s in this version. Better cacheing? I think it’ll also use AddressBook.app as a source of Clues, so if you’re having trouble getting the app to do anything, just open Address Book and look at a card – you’re guaranteed to see something.